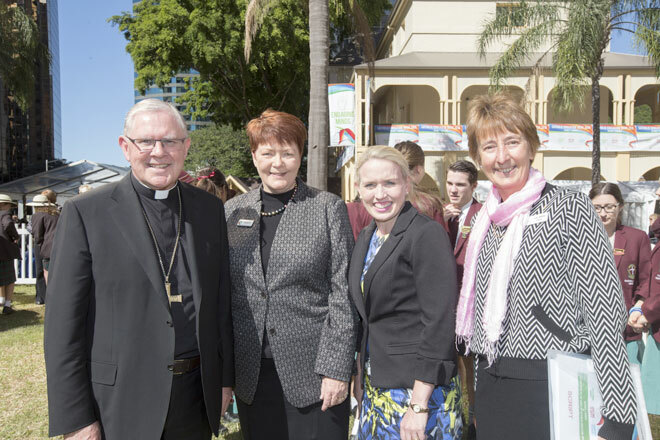 Leaders in education: Brisbane Archbishop Mark Coleridge, Brisbane Catholic Education executive director Pam Betts, Queensland Education Minister Kate Jones and Queensland Catholic Education Commission executive director Dr Lee-Anne Perry at the Catholic Education Week launch in Brisbane. QUEENSLAND’S education minister acknowledged one of the Church’s gifts to the sunshine state during the week-long salute to Catholic education last month. At the Brisbane launch of Catholic Education Week (July 26 to August 1), Minister Kate Jones said Catholic schools had been “at the forefront of education delivery even before Queensland was a state”. “And today nothing has changed,” Ms Jones said. “Since the first Catholic school opened in the Brisbane CBD 170 years ago, generations of Queenslanders have benefitted from the Catholic education system. Queensland Catholic schools educate more than 146,000 students, representing 18.5 per cent of all students in the state. “Enrolments are made up of about 78,500 primary and 67,700 secondary students and include more than 5800 Indigenous students,” Ms Jones said. Ms Jones confirmed the state government commitment to Catholic schools with a “record funding” of $25 million a year over the next three years. In last month’s budget announcement the state government increased funding for non-state schools to 7.5 per cent. Catholic schools receive approximately 20 per cent of their annual recurrent income from the state government. Queensland Catholic Education Commission executive director Dr Lee-Anne Perry said the celebrations showed Catholic schools were proud to showcase their unique benefits to society during CEW. “I have been delighted to learn of the many wonderful examples of how Catholic schools and dioceses took the opportunity during Catholic Education Week to celebrate with their local communities,” Dr Perry said. Dr Perry said the 2015 CEW Ambassadors, founders of Australia’s first mobile laundry service for the homeless, had been busy showcasing the way Catholics schools form active leaders in the community. “This year’s Ambassadors, Lucas Patchett and Nicholas Marchesi, from Orange Sky Laundry, had a very busy week, visiting schools and participating in the Festival of Catholic Education,” Dr Perry said. Brisbane Archbishop Mark Coleridge said the Catholic Church believed passionately in education, otherwise known as “the great attempt” to teach young people “the art of being a human being”. “Catholic education in Queensland and in Australia is an incredible story,” the Archbishop said. National Catholic Education Commission executive director Ross Fox said one in five children from “all corners of Australia” attend a Catholic school. Mr Fox called Catholic education “a jewel in the Church’s crown”.